There was a bit of softness in the attitude of consumers in May, with The Conference Board report that its Consumer Confidence Index dropped to 117.9 from downwardly revised 119.4 in April. While the Present Situation Index inched up from 140.3 to 140.7, the Expectations Index dropped to 102.6 from 105.4 last month. Consumers’ appraisal of current conditions held steady in May, with those saying business conditions are “good” edging down from 30.8% to 29.4%, and those saying business conditions are “bad” unchanged at 13.7%. Consumers’ also had a positive assessment of the labor market. Those who think are “plentiful” dipped slightly from 30.3% to 29.9%; however, those believe jobs are “hard to get” slipped to 18.2% from 19.4%. Consumers were less optimistic about the short-term outlook. The percentage expecting business conditions to improve over the next six months fell from 25.1% to 21.3%t, as those expecting conditions to worsen also declined from 10.4% to 10.1%. The outlook for the labor market was mixed. The proportion expecting more jobs in the months ahead was down to 18.6% from 21.9%, but those who think there will be fewer jobs dropped from 13.8% to 12.0%. The percentage of consumers who look for their incomes to rise edged up from 18.7% to 19.2%, although the proportion expecting a drop also rose -- from 7.6% to 8.7%. 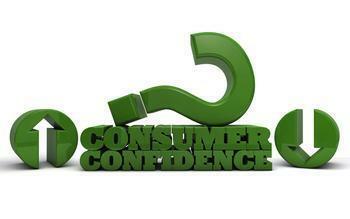 The monthly Consumer Confidence Survey, based on a probability-design random sample, is conducted for The Conference Board by Nielsen, a provider of information around what consumers buy and watch. The cutoff date for the preliminary results was May 18.